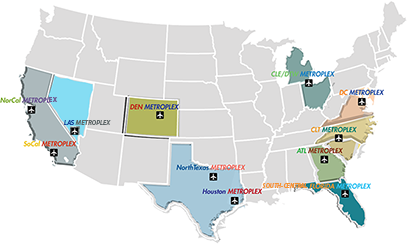 A Metroplex is a geographic area covering several airports, serving major metropolitan areas and a diversity of aviation stakeholders such as NAS users, FAA, and other lines of business and airport operators. Congestion, airport activity in close geographical proximity, and other limiting factors such as environmental constraints combine to reduce efficiency in busy Metroplexes. Watch this video to learn more. In response to recommendations from the aviation community through RTCA’s NextGen Mid-Term Implementation Task Force, the FAA is putting integrated NextGen capabilities in place to improve air traffic flow for an entire region, or metroplex. Click on map to see larger image. The FAA has identified 21 metroplexes—geographic areas that include several commercial and general aviation airports in close proximity serving large metropolitan areas. By optimizing airspace and procedures in the metroplex, the FAA provides solutions on a regional scale, rather than focusing on a single airport or set of procedures. The optimization plan takes into account all airports and airspace that support each metropolitan area as well as how air traffic in those areas interacts with other metroplexes. It considers myriad factors including safety, efficiency, capacity, access and environmental impact. Using a consistent, repeatable approach, study teams of FAA and aviation community experts analyze the operational challenges of metroplexes and explore airspace and procedures optimization opportunities. Collaborative design and implementation teams then put in place the solutions the study teams recommend, including performance-based navigation procedures and airspace redesign.